On the voyage of life we’re often fearful, confused, and question the Lord’s dealings with us. Ghislaine Spence—a wife, mother and grandmother, has felt the same. 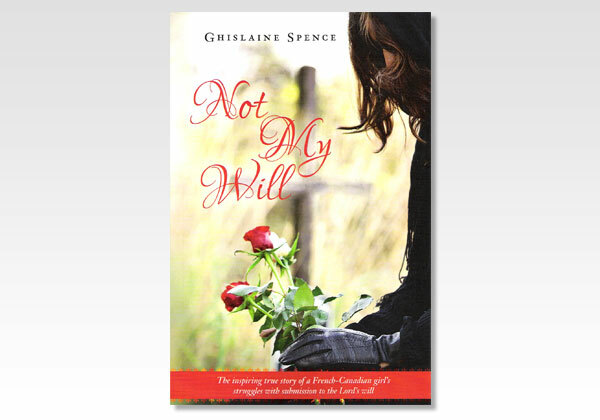 Not My Will is Spence’s autobiographical account of her journey on the pathway of life. Beginning with her early childhood in Quebec, it traces her upbringing, relationships, life experiences, and times of grief and tragedy. It also chronicles the struggles that ultimately carried her and her husband to a prison ministry. An incredibly inspiring story, it shows how the Lord sends adversity in our lives—not only to reshape us, but also to teach us the enjoyment of His love, fellowship and peace that can only come through submission to His will. “…Who teacheth like him?” (Job 36:22). Ghislaine Spence lives in Cedar Rapids, Iowa, with her husband, Dave. In 2007 the couple founded Western Gospel Duet, a volunteer group dedicated to spreading the Word of God to inmates in Iowa’s correctional institutions. As Western Gospel Duet, the Spences visit correctional facilities to share the gospel in Word and song. To reinforce their outreach, they have produced a CD specifically for the inmates entitled Daybreak, and their second album, Unchanging Love, was released in April 2014. In addition to playing the mandolin, Spence is responsible for the day-to-day management of the ministry operations and is also the editor of IPMN (Iowa Prison Ministry News). Before pursuing prison ministry, Spence was owner of Ludvicek Upholstery in the Amana Colonies, where she and her late husband, Lyle Ludvicek, lived with their five children. She also previously worked as an independent representative and trainer for Excel Communications and as vice president of Ludwell Financial Services in Casper, Wyoming.